We often hear that the human brain has far greater capacity than we use. Part of that capacity is to coordinate movements that most of us can’t even imagine, let alone execute. Among musicians, that coordination of movements combines with artistic imagination, often leading to visually or aurally pleasing results. But now and then we meet an artist whose vision is so in sync with his or her coordination that we respond with a sense of discovery—Hey, I didn’t know humans could do that! And who would have even thought to try it? 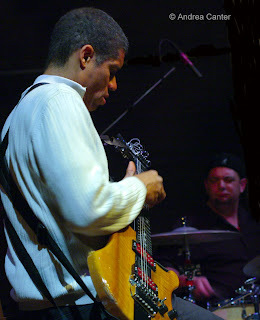 Stanley Jordan has created a unique way of expressing himself in music by reinventing guitar and piano technique. It’s his “finger-tapping” guitar that has fueled his reputation as an innovator for the past 30 years, but as he demonstrated tonight, he has an equally idiosyncratic approach to the piano as well as the skill to play both instruments simultaneously. In fact Jordan plays a guitar more like a piano, and a piano more like a guitar. He primarily uses the fretboard with both hands, the fingers that normally pluck and strum pressing the strings with a sometimes legato, sometimes staccato touch. And with the strings tuned to an alternative “fourths” progression, the sound Jordan coaxes from his electric guitar comes at you in multi-part harmony, in cascades of zen, like desert winds sweeping across lunar landscapes, sometimes howling, sometimes whispering. Brazilian standards, John Lennon hits, and Mozart concerti are all equally open to Jordan’s interpretations. 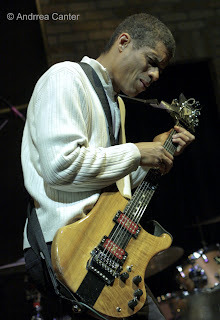 If Jordan's guitar is piantistic, his piano is most overtly a string instrument as he lightly tap dances across the keyboard, weaving intricate phrases with his right hand while the left hand works a complementary pattern on the guitar, the alternate tuning allowing melodies to unfold seamlessly. On one composition he brushed his hand across the full length of the keyboard as if strumming an 88-stringed guitar. It no longer sounds like a piano, but like a small string orchestra. Is it jazz? It is most decidedly improvisation. Be it “Eleanor Rigby” or “Piano Concerto Number 21,” there’s a shade of blues. It does not particularly swing, but it zings and sings. It’s a fusion of disparate elements and roots.